Camp F-23 was located on the site of SP-2 that was closed earlier in 1937. Company 757 occupied SP-2 from 7/37-1938 and Company 762 from 1938-1939. 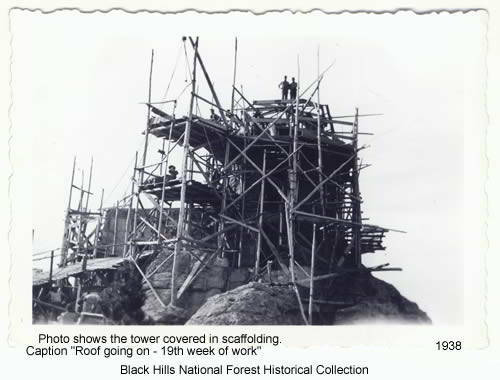 "Above the mountains of the Black Hills of South Dakota is this massive structure of stone atop the highest elevation above sea level from the Rockies to the Alps of Europe--Harney Peak. "To quote Neil Hamilton, former project superintendent of Company 791, and under whose direct supervision this task was accomplished, 'Quaint sleds were made from discarded grader blades and 3-inch pipe. The trip extends over 3 miles of trail and the boys making the trips were able to make two and a half trips a day. Two horses were used for this purpose. The sleds worked very well as long as there was snow on the ground, but with the inception of summer this part of the work proved to be no more than a horse killer. The sleds have since been replaced with small two-wheeled carts consisting of one half of an oil drum mounted on a short axle. These were pulled by one horse, being fitted with the unfamiliar old buggy shafts fashioned from 1-inch pipe. They proved very satisfactory and nearly anything could be transported to the top in these so-called 'Ben Hur Chariots'. "Perhaps the most difficult problem involved was getting material to the summit of the peak. 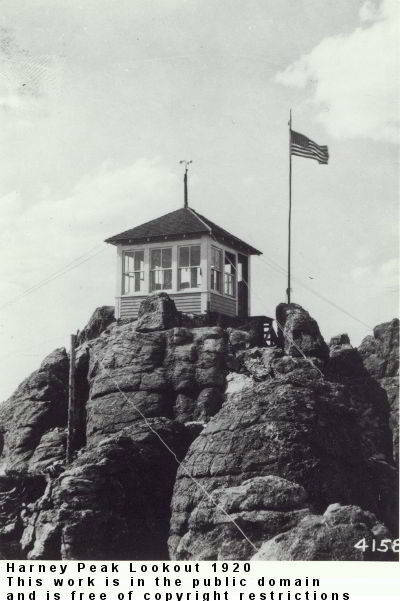 It is estimated that approximately 7,500 face rocks were needed for the completion of the building. With each 'chariot' taking up only 15 to 20 rocks per trip, one can readily realize the number of trips that are necessary. Rock suitable for this building was not available at the building site but was procured in the French Creek drainage below Custer. It is necessary to hand pick the rock from various rock slides and transport them by truck to a stock pile at the foot of the trail. A total of 1,328 sacks of cement was also needed in the building; likewise two carloads of sand. Transportation of these two items is accomplished by pack train. Ten horses were used and trips were made each day with one or the other of these articles. 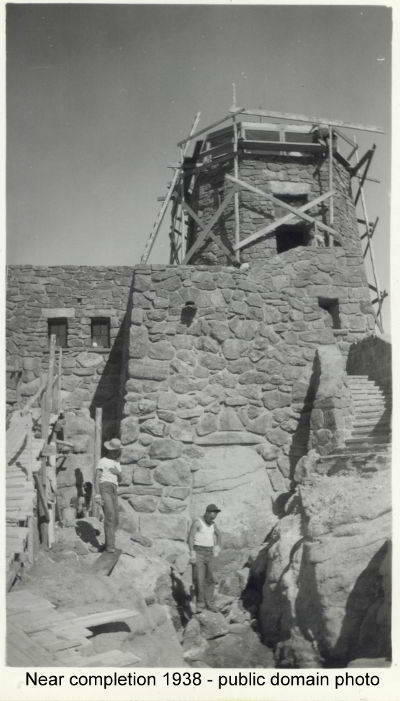 It was possible to haul 2 ½ tons of sand to the top daily and the same amount of cement if necessary.